I found a small program (49KB download) a long time ago that adds 4 new options to any window menu. 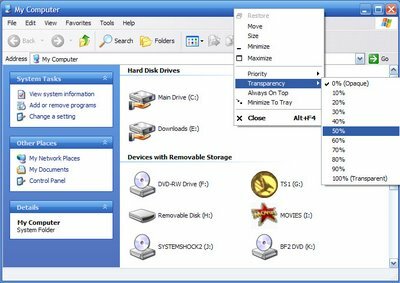 It allows you to a windows process higher priority, set always on top, set transparency, and minimize it to tray easily, quickly, and the minimal RAM usage. It is a very simple program, just right click a window and your options are there. To install the program, create a new folder in program files called PowerMenu and extract the zip file you download from its website into it. Then create a shortcut to its exe in your startup folder in the start menu and run it. Now every time your computer restarts it will automatically run.